While it seems like every day there’s a new social media update – some news is bigger than others. 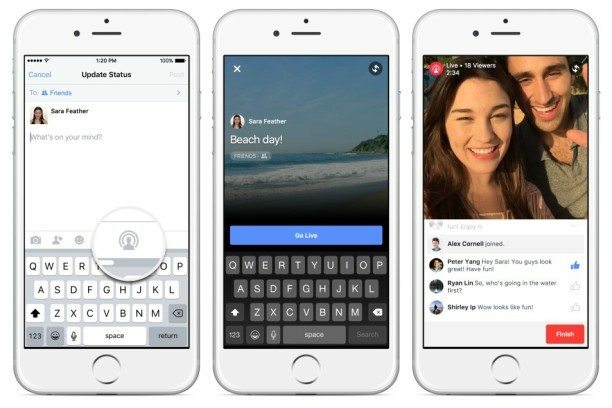 With the increased interest in live streaming on social, Facebook has upped their offerings with their new Facebook Live product – allowing for users and brands to live stream major events to daily updates with users. They officially released the offering to the public just a few days ago with their 24 hours of Facebook Live celebration, where celebrities, influencers and members of Facebook’s team shared live videos together for 24 hours straight. Definitely a unique way to catch people’s attention while getting people excited for the new offering! Besides shooting real time video, you can now broadcast live to a Facebook group, or even schedule a live Q&A session through a Facebook event. The mobile Facebook app will even have a new section in your feed dedicated to real time, live videos captured by your favorite brands and friends – ensuring that you’ll never miss a post. What we love about Facebook Live videos is that they’re even more immersive and authentic some the more run-of-the-mill videos shared by brands on the platform. Rather then repurposing commercial spots or videos created for other platforms, Facebook live gives brands the opportunity to be transparent and authentic with their followers, creating a more engaging user experience. We’re excited to see how to incorporate Facebook live with some of our clients to celebrate major events, launches and more!